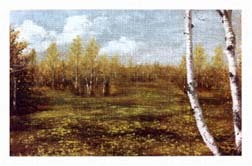 In the early part of Marys career in art she painted on burlap. She found the texture of burlap interesting because of its coarseness and its irregular grain in the fabric. 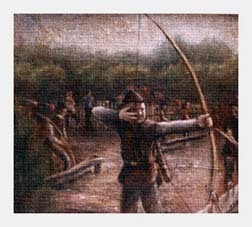 Her first attempt to paint on the burlap, Mary ran into difficulties, she had to learn to work with the rough, coarse, irregular texture of the burlap. The results were paintings rich in texture, motion and a three dimensional appearance also rich earth colors with a tapestry appearance. 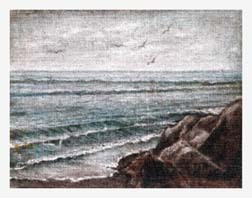 One can look at these paintings for along time and continue to see new things because of the freedoms that Mary took in painting these, leaving room for imagination by the viewer. Mary would choose from a variety of burlap fabrics for the right one for each painting and then she attached the burlap to boards or canvas and then treated the burlap with glue, which made it very coarse. It was like painting on sandpaper it ate her brushes up but the results were wonderful and she continued to paint in this medium for 10 years. The paintings look as wonderful as they did when she first painted them. 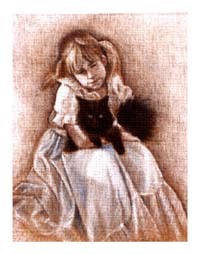 Mary no longer paints in on burlap and only has a limited number of these paintings available. Oil on Burlap 36" x 24"
This painting was done from some pictures Mary took from an outing at Angel Island. 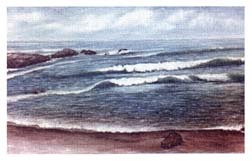 Mary wanted this painting to express the activity of the children at play on beach shore and the sailboats in the bay. Oil on Burlap on Canvas 36" x 24"
This was Marys first painting on burlap. This was a real challenge but the results from it were so wonderful that she proceeded paint many others. Oil on Burlap on Board 24" x 20"
Mary wanted to show the natural beauty of the woman selling peaches at a fruit stand. The interaction between the woman and the man purchasing some fresh peaches. 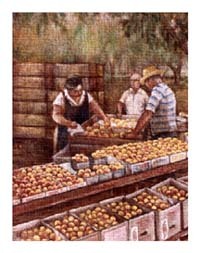 She said she found the texture and color of the peaches in the boxes appealing with the supporting trees and boxes stacked in the background which all bring the viewer back to the woman selling the peaches. Oil on Burlap on Board 20" x 24"
In the early part of Mary's career in art she painted on burlap. She found the texture of burlap interesting because of its coarse, irregular grain and its earthly appearance. She learned to work with it so that the beauty of its nature could be seen in the paintings. 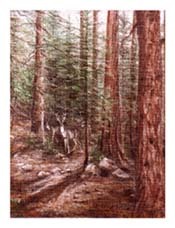 Oil on Burlap on Board 18" x 24"
In this painting Mary wanted the deer to almost blend in with the trees in the forest but yet she also wanted the viewer to see them. Hunting season hasnt started and besides they dont think you can see them as they remain very still. God made their covering so they wouldnt stand out to protect them from predators. 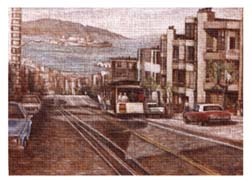 In this painting Mary wanted express the fond memories of San Francisco, the cablecar, the city with its steep streets and the view of Alcatraz and Angel Island in the background. The early morning before the streets becomes very busy with traffic. Oil on Burlap on Board 30" x 36"
In this painting Mary wanted to tell about the young girl who finds herself not quite a woman but a girl who is who is going through changes in her life. 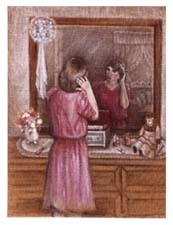 As she is fixing her hair with a few last touches she looks at the reflection in the mirror she wonders how others will see her. Mary placed some of the things that you might find on the top of a dresser of a young girl in transition; jewelry, lipstick, hairbrush and nail polish. She also included a doll and a flower girl bouquet hung on the mirror which keep fond memories of her past alive. Oil on Burlap on Canvas 20" x 16"
Oil on Burlap on Canvas 48" x 24"